* Each player has personally signed the back (on the number) of their match worn Match Day Guernsey (all guernseys will be washed), so if you wish to have this piece framed, this is your opportunity. * The guernsey’s being auctioned will be the first time player names appear on guernsey’s worn in a home and away game. * All player guernsey’s (including those who don’t play against The Western Bulldogs) will be available to bid on. 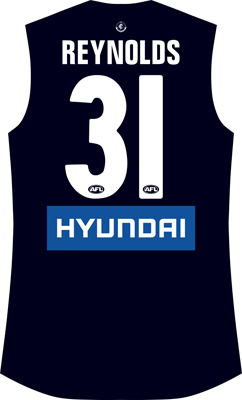 Please note: Should any player make their debut in Rnd 5 vs Western Bulldogs, in keeping with Club tradition this player will be presented their match guernsey, therefore it will not be available for auction. Any bids made on this guernsey will be retracted following selection on Thursday 17th April, 2014.